President Donald Trump's oldest son on Monday released a series of direct messages he received from the Twitter account behind the WikiLeaks website, including his responses to the communications. Donald Trump Jr.'s release of the messages on Twitter cames hours after The Atlantic first reported them. 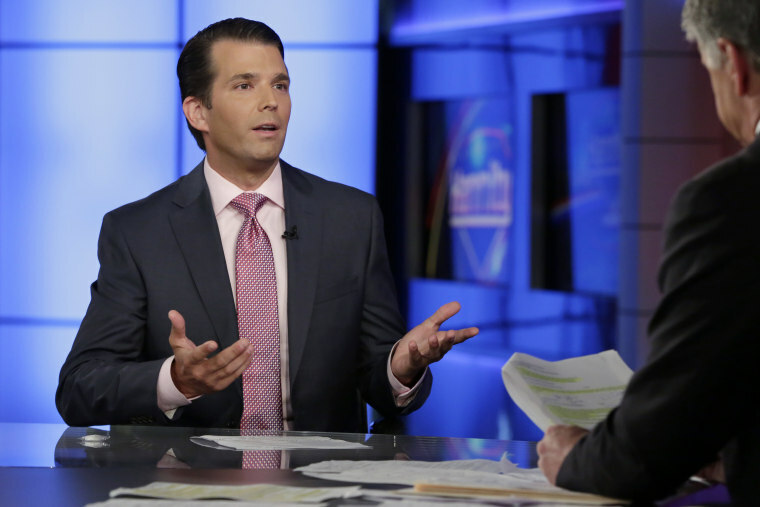 In the exchanges — some of them around the time that the website was releasing stolen emails from Democrat Hillary Clinton's campaign chairman — WikiLeaks asks Trump Jr. to push its leaks and to release his father's tax returns to the site. The documents released by Trump Jr. show him responding three times, at one point agreeing to "ask around" about a political action committee WikiLeaks had mentioned. He also asked the site about a rumor about an upcoming leak. The messages began in September 2016 and ran through July. Trump Jr. downplayed the exchanges as he released them. "Here is the entire chain of messages with @wikileaks (with my whopping 3 responses) which one of the congressional committees has chosen to selectively leak," he tweeted. "How ironic!" The direct messages had been turned over to congressional committees investigating Russian intervention in the 2016 election and if there were any links to Trump's campaign. In a statement, Trump Jr.'s lawyer said thousands of documents had been turned over to the committees. "Putting aside the question as to why or by whom such documents, provided to Congress under promises of confidentiality, have been selectively leaked, we can say with confidence that we have no concerns about these documents and any questions raised about them have been easily answered in the appropriate forum," said Alan Futerfas. Vice President Mike Pence responded quickly to the report, issuing a statement through his press secretary that he knew nothing about it. "The Vice President was never aware of anyone associated with the campaign being in contact with Wikileaks," said spokeswoman Alyssa Farah. "He first learned of this news from a published report earlier tonight." WikiLeaks editor Julian Assange tweeted after The Atlantic report that he couldn't confirm the messages but then defended them after Trump Jr. released them. "WikiLeaks appears to beguile some people into transparency by convincing them that it is in their interest," Assange tweeted. Democrats swiftly reacted to the report, saying Trump Jr. should provide more information. California Rep. Adam Schiff, the top Democrat on the House intelligence committee, says it "demonstrates once again a willingness by the highest levels of the Trump campaign to accept foreign assistance." Democratic Sen. Richard Blumenthal, a member of the Senate Judiciary Committee, said that panel should subpoena the documents and force Trump Jr. to publicly testify. Trump Jr. spoke privately to staff in March. "There seems to be no reasonable explanation for these messages," Blumenthal said.